From KKD: How is it that Justice Connors completely ignores jurisdiction in the Sykes case, but can write up a full decision in support of the 5th Amendment for another case. Unbelievable. And how is this a “rule 23” decision that is not supposed to be cited. Now attorneys in Illinois cannot cite cases that fully support the 5th Amendment? I believe that violates the First Amendment. Rule 23 is clearly unconstitutional under the First Amendment. This Johnson case that Attorney Denison refers is particularly galling as Justice Connors openly and notoriously ignored the jurisdictional requirements in the Mary Sykes case 09 P 4585 and Jerome Larkin, using the power of his office as administrator of the Illinois Attorney Registration and Disciplinary Commission attempted to silence protest. ELDER CLEANSING/HUMAN TRAFFICKING is today a major business in the UNITED STATES. The Political and Judicial elite use organizations such as the attorney disciplinary commissions to silence lawyers (Rule 8.3 and 18 USCA 4 notwithstanding). The media is dead silence, and law enforcement impotent as they can ferret out the criminals who commit these dastardly crimes by judges (some corrupt and easily influenced by a share of wealth) are required to prosecute them. Using opioids and other chemicals to turn healthy vibrant senior citizens into zombies thousand upon thousands of VOTES are delivered to political fiefdoms by “nursing home operators” and whole elections are turned. “The government is the potent omnipresent teacher. For good or ill it teaches the whole people by its example. Crime is contagious. If the government becomes a lawbreaker, it breeds contempt for law; it invites every man to become a law unto himself; it invites anarchy. To declare that the end justifies the means — to declare that the government may commit crimes — would bring terrible retribution.” Judge Louis Brandeis, Olmstead v. US 277 US 438. This is a letter in response to an assistant states attorney from the offices of Lisa Madigan advising me that my complaints against the Probate Court and its staff would not be investigated or prosecuted because they don’t do that. If not the Attorney General of Illinois, then who will stop these crimes against me and other innocent Illinois citizens? This is in response to your assertion that the Attorney General of Illinois (Lisa Madigan) has no jurisdiction to investigate or prosecute public corruption or crimes committed by court staff, the clerk of court’s offices and judges and Cook County Sheriff’s department employees. I vehemently and assiduously beg to differ with this assertion of yours. However, the Illinois JIB rarely prosecutes cases. Thousands of grievances against judges are filed each year in Illinois but only less than .5 percent result in any discipline. In this case, Judge O’Malley changed a docket date to deny me my hearing. She did it in a conspiracy with her clerk and Attorney David Blocher. All of these persons have committed the crimes of docket tampering, file tampering, destruction or spoliation of evidence and each is a felony. The JIB has no jurisdiction over criminal activities. I note that Judge Jessica Arong O’Brien’s assistant just pled guilty in federal court to loan or bank fraud so she can testify against Judge O’Brien next month and get a lighter sentence. The FBI is doing it. Also, it is incorrect that “there are no problems” in probate. I would like to direct your attention to the following blogs which have tons and tons of stories about theft of estates by judges and attorneys and GALs: http://www.marygsykes.com, NASGA or National Association to Stop Guardian Abuse, http://www.probatesharks.com, http://Www.aaapg.com, and many others. In addition, I am attaching a PDF file of numerous cases in Illinois and from the US relating numerous tales of probate court corruption. Finally, I would like to direct your attention to two instances where the Cook County Sheriff’s offices were complicit in corruption at the Daley Center. During a first court date, I was told by Deputy Coughlin “this is my floor, I do what I want on my floor, and if you don’t leave the building immediately I will have you arrested.” This was after I was try to open my mother’s estate and the judge wouldn’t let me because I didn’t have an attorney. I told the judge there is no law and nothing in the Illinois Probate Act that requires me to have an attorney. That’s when the Judge (Malone) told the clerk to get the sheriffs on me. After Deputy Coughlin escorted me out of the Daley Center, she told me that if I came back (to court) for any reason, she would have me arrested. During another court date, on my father’s estate, Sheriff Sanchez told me “if you don’t play the game the way the judges want, then you get to see ‘Big Bubba’”–implying a threat I would be beaten, arrested or abused. And she took me to see “Big Bubba” who held me up for a few hours telling me I did something wrong in court, when I did not. The judge was letting my sister steal about $300k from my father’s estate with impunity. The judge was mad that I told him that. I would appreciate your investigating these crimes and keeping our courts safe, open and transparent. A former associate of Cook County Judge Jessica Arong O’Brien pleaded guilty Friday to her role in a $1.4 million mortgage fraud scheme and is expected to testify at O’Brien’s criminal trial next month. Maria Bartko, 50, of Streamwood, pleaded guilty to one count of mail fraud affecting a financial institution. U.S. District Judge Thomas Durkin put off setting a sentencing date until after Bartko’s anticipated testimony against O’Brien, who is scheduled to go to trial Feb. 5 on mail and bank fraud charges stemming from the same alleged scheme. O’Brien has pleaded not guilty. Federal sentencing guidelines call for up to about three years in prison for Bartko, but prosecutors said they will recommend a reduced sentence of about a year and a half if she testifies truthfully, according to her plea agreement. An indictment last year charged O’Brien with lying to lenders to obtain more than $1.4 million in mortgages on two South Side investment properties that she bought and sold between 2004 and 2007 when she owned a real estate company and worked part time as a loan originator for a Lincolnwood real estate company. She was then also working as a special assistant attorney general for the Illinois Department of Revenue. O’Brien was elected to the bench in 2012 as the first Filipina judge in Cook County and had most recently presided over a small-claims courtroom. She’s since been reassigned to administrative duties pending the outcome of the criminal case. At the time of the alleged scheme, Bartko was a loan originator at Amronbanc Mortgage Corp., where O’Brien was working part time, according to the indictment. O’Brien allegedly used fraudulently obtained mortgage loan proceeds to buy an investment property in the 600 block of West 46th Street in Chicago and then lied on applications to refinance the mortgage on the property as well as on a second investment property in the 800 block of West 54th Street in Chicago. The indictment also alleges that O’Brien fraudulently obtained a commercial line of credit to maintain the properties before selling them to Bartko and a straw buyer. Asked by Durkin on Friday to put succinctly in her own words what she did, Bartko launched instead into a lengthy explanation about how she was simply following the direction of her superiors at the bank. As a single mom, she said, she was looking to make extra money. O’Brien, who is married to a judge, immigrated to the U.S. after high school, earning degrees in culinary arts and restaurant management, according to online biographies. She then made a career change and attended John Marshall Law School, graduating in 1998 and later serving on its board. She was the first Asian elected president of the Women’s Bar Association of Illinois and also served on the board of governors for the Illinois State Bar Association. The judge also co-founded a foundation in 2008 that awards scholarships to law students from diverse backgrounds. Judge Jessica OBrien has been indicted, why is Timothy Evans keeping her on the payroll and burdening taxpayers? Also, when is the FBI going to investigate all the funky property records of attorneys Jerome Larkin, Melissa Smart and other Judges who are making clearly biased rulings and I have a ton of information on those problems? Who is looking into that? Today I got a call from a client who sent off grievances to the FBI, the DOJ, the states attorneys, the OIG, the OIEG and other places. An attorney from Lisa Madigan’s offices called him up and says that Lisa Madigan will not prosecute a judge who helped an attorney and his client break a trust and steal $300,000+ from an estate and who changed a court date (docket tampering and file tampering, both felonies), he says he never heard of any probate corruption before. The client gave him this blog and NASGA blog and probatesharks.com so he will get an earful. How do these people get hired for $50k plus per year and they deny knowing anything about court corruption and deny it as if it does not exist? Un freaking believable. I will publish the name of the attorney soon as I get it. ​Esmond Allcock says the secret to living 108 years is to select the proper spouse. 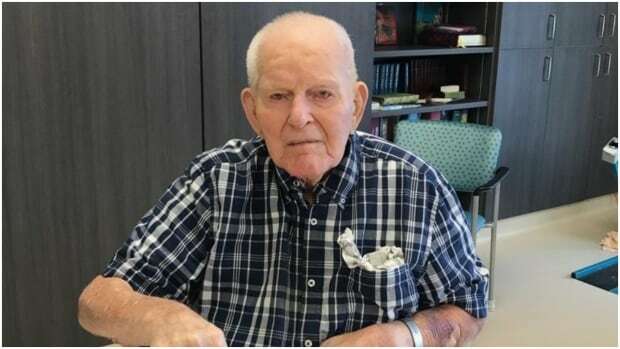 Allcock, from Kerrobert, Sask., located about 200 kilometres southwest of Saskatoon, celebrated his 108th birthday on Friday and is the oldest man in Canada. “I didn’t behave myself for a few years there, but then I got a really good wife,” he said, when asked how he managed to live a long and happy life. His wife Helen passed away seven years ago after 72 years of marriage. He lived alone in the family home for a short time and then decided to move into the Kerrobert Health Centre. 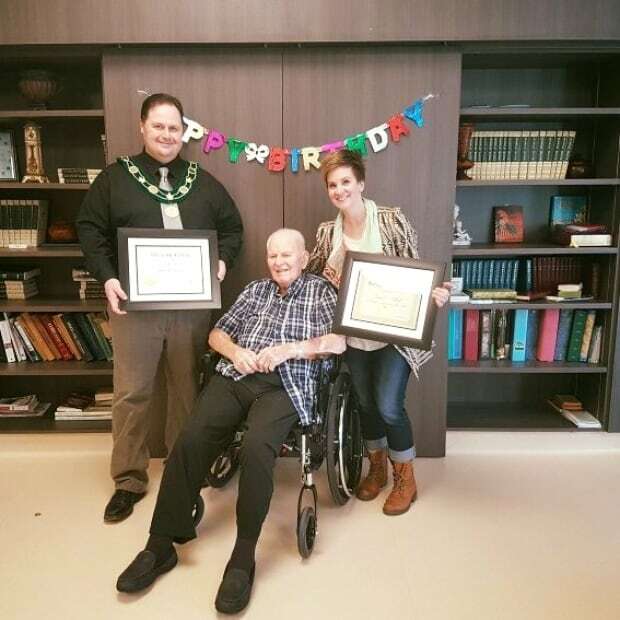 On Friday employees at the centre threw the 108-year-old a birthday party. “Oh they nearly drove me nuts. They probably took 100 pictures of me,” he said laughing. The town’s Mayor, Wayne Mock, also attended the party. He honoured the self-proclaimed Blue Jays baseball super-fan by declaring January 26 as Esmond Allcock Day. Although his son Dale Allcock, 78, couldn’t make it to the party from Port Coquitlam, B.C., the two Facetimed beforehand. “We Facetime every day on his iPad and you can really tell how happy he is, and they treat him like gold in there,” he said. Staff wrapped up the party with his favourite meal: steak, carrots and fruit. According to his son, Allcock has lived in Kerrobert for 100 years and worked as a farmer before retiring in 1965. He has 67 living relatives which includes 38 great grandchildren. “He really is a gift. That’s about all we can call that,” said Dale. On January 18, 2018, the Office of Attorney General forwarded your complaint to the Department of Children and Families Office of Inspector General concerning the handling of a case. No further action will be taken by this office. The Florida Attorney General’s Office received your correspondence regarding your concerns with attorney Roy Lustig and Judge Michael Genden in relation to a guardianship and criminal case involving Helen Stone and Barbara Stone. Finally, because our office is not at liberty to give legal opinions to individuals, if you need legal guidance, again please consult a private attorney, The Florida Bar offers a Lawyer Referral Service toll-free at (800) 342-8011 or online at https://www.floridabar.org/public/lrs/. Thank you for contacting Attorney General Bondi’s office. Please understand the Attorney General’s duties are prescribed by law. To contact this office please visit the Attorney General’s website at http://www.myfloridalegal.com and complete the on-line contact form. Again, thank you for contacting the Office of the Florida Attorney General. I am writing to you to demand the immediate release of Lawyer Barbara Stone. I fell asleep and woke up having a nightmare about the speech I am giving Tuesday going horribly wrong. Since it is a topic that I am passionate about I was just going to wing it but decided to jump up and prepare a speech. Please tell me how it sounds. I don’t want it to sound formal or scripted, I want it to sound authentic and down to earth. I intend to add some unscripted conversation into it but overall I would like to follow this format. If there are typos or misspellings it is not because I am stupid or careless, it is because I am exhausted and I wrote this with a migraine so I can’t even hardly see what I am writing due to my visual aura disturbing my vision. Hi, thank you for allowing me to speak to you for a few minutes about domestic violence from a survivior’s perspective. All of you are on the frontlines of this battle. You have the very challenging task of responding to these calls and responding in a manner that keeps women and children safe. I do understand that men can be abused as well but since 95% of interpersonal violence is perpetrated against women I am going to speak about that. My brother used to be a deputy in Caroline County so I have been able to hear about the challenges of these calls. Not only are they difficult to evaluate but they are some of the most dangerous calls you can go on. I do not envy your position at all, and as a survivor I am grateful for the job you do. I am going to give you a little information that you may find helpful, you may not but as a survivor they are things we want you to know. I think perhaps one of the most important issues is bias. We all have biases, we don’t even realize it sometimes, these biases frequently lay just below the surface of our concious thought and we do not intend any harm with them but they can be dangerous when trying to make a determination if dv did occur or not. When it comes to DV there are a few dangerous biases that can happen. The first one is that false accusations of abuse are rampant. They aren’t. Women make false accusations less than 2% of the time, I believe the actual number is 1.8%. So if a woman is saying abuse occurred it is most likely true. On that same note many abusers will play the victim and accuse the real victim of being the abuser. This is a common tactic of DV abusers to silence their victims. To complicate the situation further, the victim may have harmed the abuser, there may be marks, but it was very likely self defense. To illustrate this, back in October of 2011 my husband at the time took my 4 children hostage when I was out of the house taking a breather. It had been a long rough day parenting my little 9 month old who had been extremely clingy and I had needed about an hour of time to restore myself. My husband did not like this, he wasn’t an active participant in parenting and he took offense to me getting some time to myself and leaving him to care for the children. As a punishment he locked them all inside our master bathroom and told them all that “mommy was coming back to kill them”. They knew the truth but they were fearful of him and kept quiet. When I returned home my house was quiet. WIth four kids it was usually loud and lively. I could not find the children. I searched everywhere calling their names. Finally I approached the master bedroom and the door was locked. My husband wouldn’t open the door and he wouldn’t answer me, I started to cry and beg. He finally came out and told me that I was “(insert expletive) insane and that I was a harm to myself and others”…remember this was all because I took an hour to drive to Starbucks and come back. For 45 minutes I called for my children to answer me. They didn’t. I finally gave my husband a warning that I would have to call the police if he didn’t show me that the children were okay. He knew that I was panicked. As I was dialing 911, he walked up behind me and hit me hard across the back of my head and took the phone out of my hand and threw it to the ground, shattering it. Our baby was in his arms and she kept reaching out to me crying “mama, mama, mama!” and he wouldn’t let me touch her, every time I attempted to he would slap my hands away. As he towered over me (he is 6’4) screaming at me and poking his finger into my forehead, he eventually had me cornered in our kitchen…within reach of our knives. I saw his eyes darting back and forth between me and the knives and at one point his arms reached towards the knives…I slapped him. I was NOT abusing him, this was self defense and I knew that it would startle him momentarily allowing me to push past him to run upstairs to my other children. I didn’t make it far, he set our daughter on the floor and pushed me to the hardwood floor and then turned my body around, slammed my head to the ground, restrained my wrist, spit on me, and told me he was calling the police. When the older children came out of the room crying he left me alone, I gathered up the children and left for a week. While I was gone he would send me harassing texts that the sheriff’s department was looking for me. During that week he told people we knew and posted on my facebook profile that I had “punched him in the face with our baby in our arms, just missing the baby’s head.” Had the sheriff’s office been called that night and a deputy responded it would have been a very confusing situation to walk in on. I am certain my husband would have told them the story he told his friends and posted on my facebook wall, but it would not have been true. Yes, I did slap him, with an open hand, but it was in self defense, not out of anger and/or aggression. These things are very, very different. Always be mindful of the potential of this happening when you respond to a call. Another bias I have run into since leaving is the bias of socioeconoimic status. I never actually called the sheriff’s dept on my husband so I can’t say that the deputies responded with this bias but the court system has. I have been told multiple times by officials in the court system that affluent and educated men don’t abuse their wives or children. I am here to tell you that they do and it is easier for them to get away with it because most people think of an abuser as a guy in a “wife beater shirt” sitting in a lazy boy chair sipping beer after beer. This is a dangerous misconception! Just because there is a BMW parked in the driveway of the large fancy house of the call you are responding to does not mean that the well dressed and well spoken man who opens the door is not abusing his partner. Abuse cuts across all social classes! But because of this bias, women in higher socioeconomic classes actually have a harder time escaping from their abuser. And the last misconception/bias is the one that the victim/abuser dad gives off themselves by their emotional states. I can only speak from my own experience and the experience of many other victims that have shared their stories with me but let’s just say…not everything is as it seems. Odds are that when you make contact with the couple, the female is likely to be upset, crying, maybe even screaming in hysterics. She may be hostile as well. The other party is likely to be calm, charismatic, charming, maybe even using humor to laugh off his partner’s current emotional state insinuating that she is a “few cards short of a full deck” and prone to dramatics to get her way. He will have excuses for whatever she may have told you. He will seem believable, she may not. You will perhaps think that she is just one of those crazy women calling the police to manipulate or punish her partner. Tread cautiously. I urge you to please try to convince her to reach out to a domestic violence center, give her the number, you can even give her my number, she can text me, I will do everything in my power to get her help. She will probably not present well and will not be very likable but please don’t judge her credibility based on this. Victims live in a primal survival mode, in this mode we are operating off of our ancient reptilian brain, we don’t have higher thought, we are not very likable in this mode. But this is how we operate when we are in fear. This should actually be a red flag that something did occur. She may have survived but she can die hours or even weeks later from swelling of the tissue inside her throat or fluid build up in the lungs caused by the strangulation. It is important to let her know what grave risk she is at by staying with a partner who strangles her. To quote Casey Gwinn again: “Men who strangle women are the most dangerous men on the planet.” and to quote his colleague Gael Strack: “Strangulation is the last warning shot.” You can save many lives by being diligent in a case where a victim says she was choked/strangled. Thank you for the work you do, it is important work, it is brave work. Thank you for risking your own lives to protect ours. Las Vegas, NV (KTNV) – Thanks in part to a Contact 13 Investigation, the state is stepping up to help protect our most vulnerable residents. Contact 13 Chief Investigator Darcy Spears has new information in her ongoing expose of a system that many say fails to protect those who need help the most. 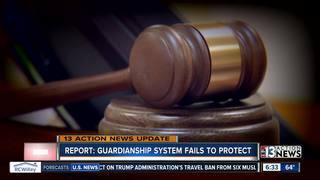 Our series of reports prompted the Nevada Supreme Court to take a serious look at how the guardianship system was failing. One of the key recommendations – create a permanent Guardianship Compliance Office to support and protect the rights of people under guardianship. Today the Nevada Supreme Court announced Kathleen McCloskey will run the new office. 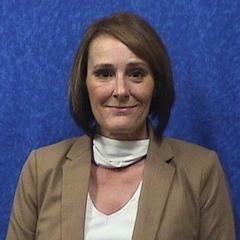 McCloskey previously worked for Nevada Aging and Disability Services. Her first task will be hiring an investigator and forensic financial specialist to help courts overseeing guardianship cases. Our investigation revealed heart-wrenching stories where loved ones were isolated from family. Houses were sold without court approval and entire life savings were drained away. The Guardianship Compliance Office will also set up a toll-free hotline where anyone who suspects abuse or exploitation in a guardianship case can report those concerns. You can reach the Contact 13 Call For Action team at 702-368-2255, weekdays between 11a.m. and 1p.m. orclick here to submit a complaint form.